A number of industries that use and manufacture hazardous or toxic chemicals prefer to work with ArlynGuard Scales. This can include locations like aircraft hangers, spray finishing areas, utility gas plants, petroleum refineries, gasoline dispensing and storage areas and any manufacturing facility that handles or stores liquefied petroleum or natural gases. The benefits of these scales are numerous. They can operate within the dangerous conditions of these industries. These scales also follow the strict guidelines for working with these materials as laid out by the Occupational Safety & Hazard (OSHA) and the National Electric Code. Chemical manufacturers across the country use our scales. Arlyn Scales would like to take the time to name a few simple reasons for that. Arlyn Scales is uniquely positioned to provide highly specialized equipment for our customers. This is as a US-based factory-direct industrial scales manufacturer and subassembly operation. • Load Cell Models 620-300-IS, 620-100-IS, 620-50-IS, 620-25-IS, 620-10-IS, 520-10000L-IS, 520-5000L-IS, 520-5000IS, 520-2500-IS, 520-1250-IS, 320-500-IS and 320-250-IS which are FM Approved components as per Approval Standard 3600, 3610, 3611 and 3810. Certain industries may work with chemicals including sodium hydroxide, aluminum, sodium hypochlorite and members of the phosphate group of chemicals. These can be dangerous, but with the proper equipment, they can be managed professionally. This is an absolutely critical part of the function of many chemical industries. We know that the first step in building a corrosion-resistant scale is ensuring tough construction. Arlyn’s scales are welded of stainless steel for a tough and rugged framework that will withstand intense circumstances. To create the best chemical protection, we have developed a unique three-part epoxy coating coated over stainless steel. We combine that epoxy coating with garnet particles to add protection against abrasion and scratches to the surface. The load cells are fabricated from a heat-treated alloy of stainless steel that was picked for this design. These combined materials allow for a rugged and durable construction and specialized coating to protect against chemical hazards ensures that your scale will deliver years of simple and reliable service. Certain chemicals can be unstable at various stages of the manufacturing or mixing process. It is important to be prepared for an accident involving an explosion and fire. Your scale can be part of your facility’s preparation for that possibility. Arlyn Scales has designed intrinsically safe scales for a wide range of hazardous locations. This can be useful when dealing with some of the corrosive chemicals, or other unstable materials. Those familiar with working with hazardous chemicals and the laws associated with them will find scales that work with Class I, II, III, Division 1, Groups A, B, C, D, E, F & G and Class I, Zone 0, AExia IIC (T3 Ta=60C). Some scales are also suited to use in Class II, Division 2, Groups F & G, Class II, Division 2 indoor hazardous (classified) locations. These regulations and specifications do not prevent the scale from operating with precise sensitivity and accuracy. They are sensitivities as high as .02 pounds with an internal resolution of 1 part of 500,000. Along with these features of safety, the scale controls are easy to use, and come with an automatic keyboard tare. This ease of use is an essential part of the overall safety of the facility as well. The more complicated the process is, the more that can go wrong. Model F-100. 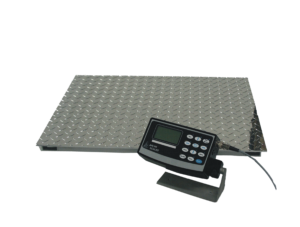 This scale is one of our larger corrosion resistant models with a platform size of 60” by 60”. An enormous capacity of 10,000 pounds and a resolution of 2 pounds make this a great scale for most heavy applications. These qualities apply to scales of a wide range of capacity, from small amounts of material to big liquid cylinder drums. None of these benefits have to come with the drawback of a cumbersome and clunky integration. On the contrary, ArlynGuard scales can interface and communicate with a wide range of technology. Arlyn Scales offers equipment for automation and data transfer that can happen without too much intervention from employees. Not only does this cut down on employees handling hazardous materials, you can increase the precision of measurements by automating that process as well. Smooth and functional integration of new scales can be done with ease given the wide range of input and output options available with Arlyn Scales. Our scales can work with a wide variety of digital or analogue outputs. Not only that, you will find this safety, precision and accuracy at a price that winds up being competitive when you consider that less optimal scales will only cost you in terms of equipment repair and replacement, and product damage. Arlyn Scales can outfit an enormous range of companies with different needs. It doesn’t matter if the materials that must be weighed are in a freezer, or just might catch fire, Arlyn Scales has served companies from coast to coast. We look forward to hearing about the details of your industry, and how we can outfit you with the best possible weigh system. Contact Arlyn Scales by calling 800-645-4301 or by visiting our website here.